The Westmoreland Glass Company started his own glass company, George West and Sons. Charles West became president while J.J. Brainard became vice president of Westmoreland. The company changed its name to the Westmoreland Glass Company. Prior to his departure, George West created a large decorating department at Westmoreland. 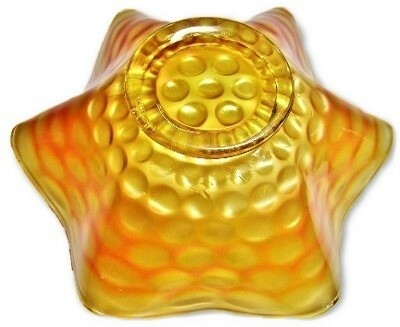 Under the direction of Charles West, the company began to make high-quality hand decorated glass from the 1920s through the 1930s, some of which was exhibited at the Carnegie Museum in Pittsburgh, Pennsylvania. In 1937, Charles West retired and sold his interest to the Brainard family, which controlled the company until 1980. 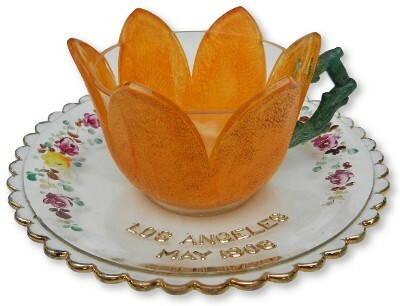 In the 1940s, the Brainards phased out the high-quality hand decorated glass and began to produce primarily milk glass. In 1980, the Brainards sold the company to St. Louis, Missouri businessman David Grossman, who had no prior experience running a large glass manufacturing company. The company went out of business in 1984 and was sold for $75,000 to George Snyder, who converted the property into a storage facility. 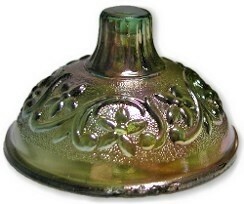 The Westmoreland Glass Company's main product was milk glass. 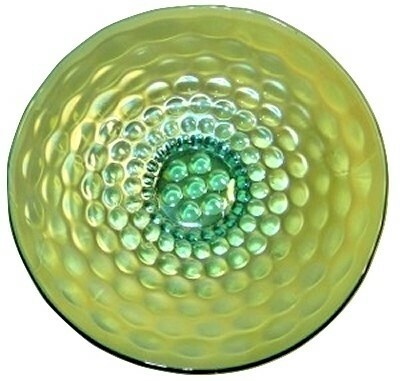 From the 1920s to the 1950s it was estimated that 90 percent of the production was milk glass. 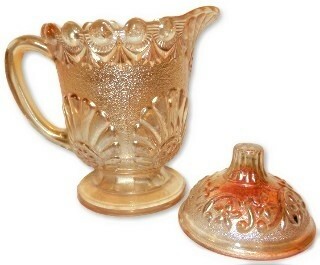 Westmoreland produced carnival glass in the 1920s and reissued novelties and pattern glass in carnival treatments in the 1970s until the plant closed in 1984. 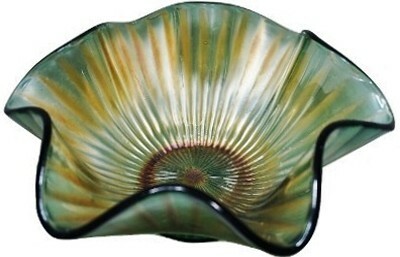 Westmoreland also produced high quality hand decorated and cut glass. 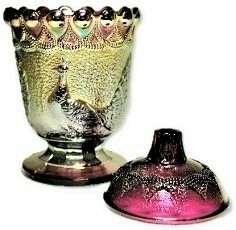 The items offered for sale on this page are antique/vintage Carnival Glass from the "classic era" circa 1907-1930 unless otherwise noted. As such, the items may have normal anomalies present, such as straw marks, tool marks, slight spotting from the making in the finish, normal use shelf wear, small interior glass bubbles which are not broken or very slight seam or edge wear roughness to the touch which would not be considered as flakes nor fleabites. 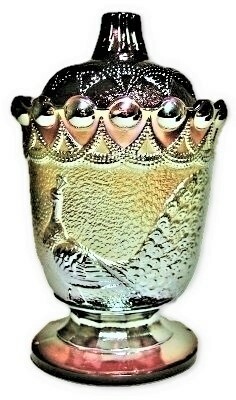 Amethyst CORINTH pattern straight vase. 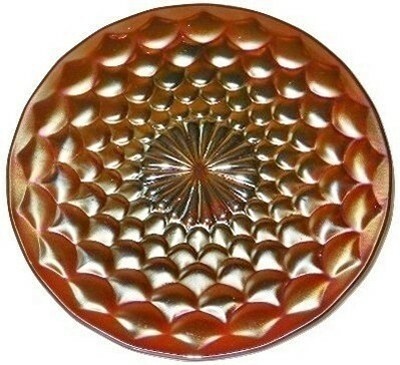 This item has a very nice over all rich iridescent finish. 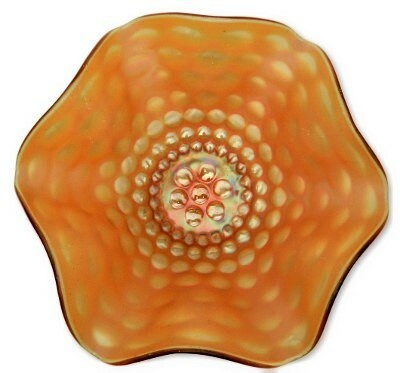 Stands 8" tall, 4 1/4" across the top and the base measures 3" across. No chips, cracks or repairs. 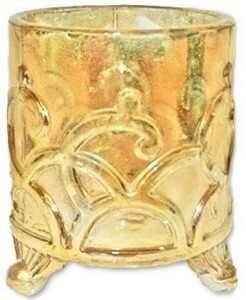 Smoke and gold ESTATE pattern toothpick holder. Sitting upon 3 small molded feet, this seldom found item measures 2 1/4" high and 2 1/4" across from the outside of foot to foot. No chips, cracks or repairs. 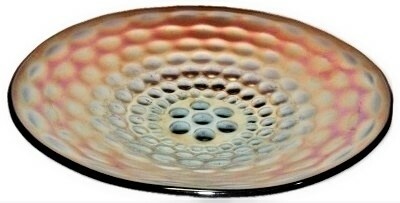 Aqua Pearly Dots low bowl. This item has a myriad of in the making straw marks, ripples, no damage and only the lightest amount of wear. Measures 8 3/4" X 2 1/4". No chips, cracks or repairs. 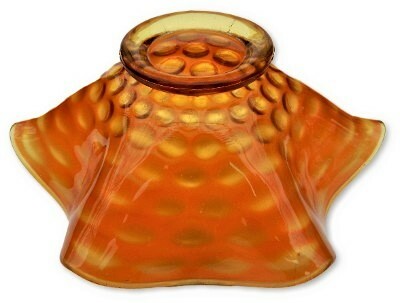 Amber Pearly Dots bowl. Measures 8 1/4" X 3". Small in the making closed bubbles and some very light stacking wear. No chips, cracks or repairs. 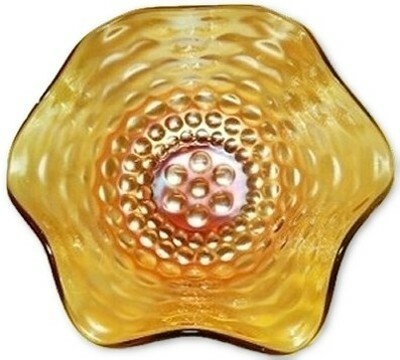 Amber Pearly Dots bowl. Measures 8 1/4" X 3". No chips, cracks or repairs. Lavender Pearly Dots bowl. Measures 8 1/2" X 2 3/4". The finish does have some light utensil marks and use wear. No chips, cracks or repairs. 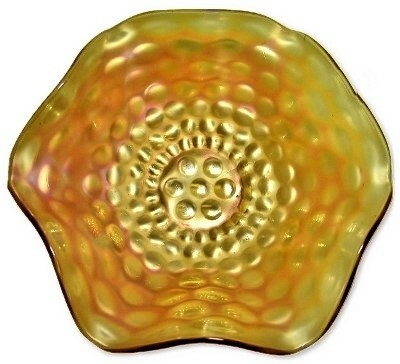 Yellow Pearly Dots bowl. Measures 8 1/2" X 3". No chips, cracks or repairs. 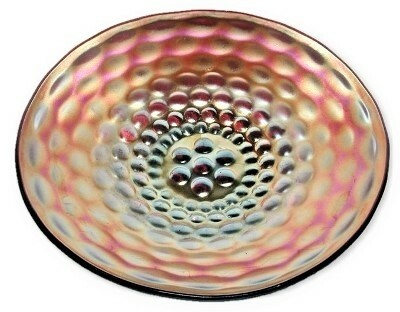 Amethyst Pearly Dots deep plate. Measuring 8 5/8" across and sitting 1 7/8" high. 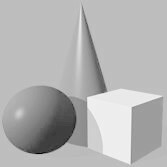 Light surface use wear. No chips, cracks or repairs. 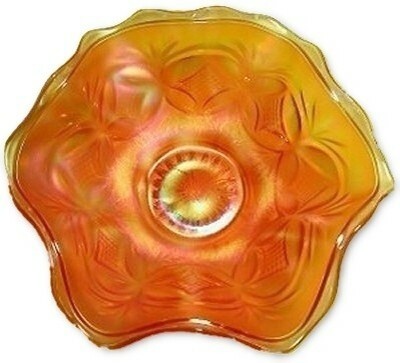 Marigold Pillow and Sunburst ruffled edge bowl. Measuring 8 1/4" across and sitting 2 3/4" high. There is very faint use wear to the interior of the bowl. No chips, cracks or repairs. 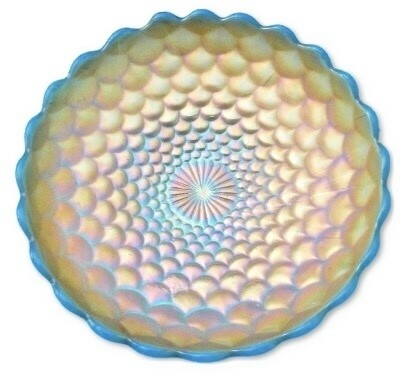 SCALES pattern "BLUE OPALESCENT SLAG" ice cream shape bowl. Measures 8 1/4" X 2 1/4". 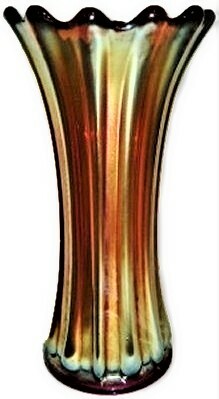 The glass has a myriad of opalescent striations running throughout the entire piece and for this reason we determine this example to have a "SLAG" effect. There are a number a small tooling marks front and back and one of the rounded sections on the rim is slightly out of round from the tooling. Very minor wear to the iridescent finish which we believe to be one of the finest you will find on this very sought after color and form. 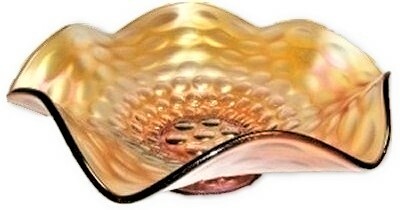 You can see in the image of the underside of the bowl, a few extra opalescent blobs of glass from the manufacturing process as well. No chips, cracks or repairs. 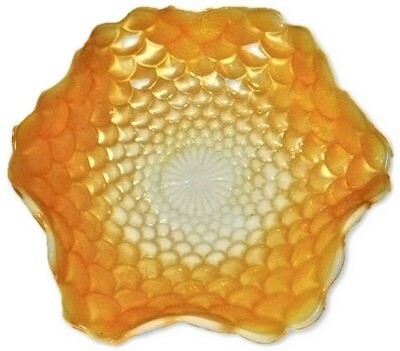 Marigold on milk glass SCALES pattern ruffled bowl. Measures 8 1/2" X 2 3/4". 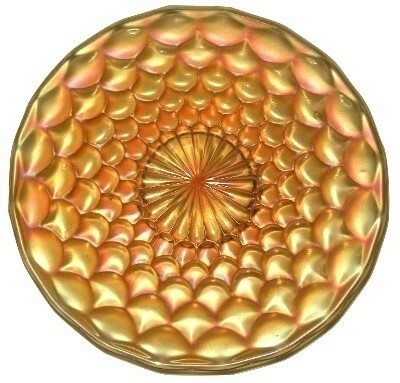 The marigold iridescent finish is even darker on the reverse side of the bowl. No chips, cracks or repairs. 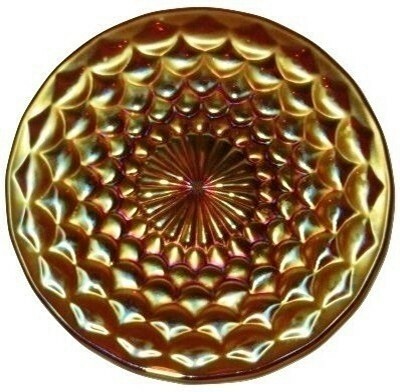 SCARCE marigold SCALES pattern plate. Measures 6 1/4" across. No chips, cracks or repairs. Purple SCALES pattern plate. Measures 6 1/4" across. No chips, cracks or repairs. 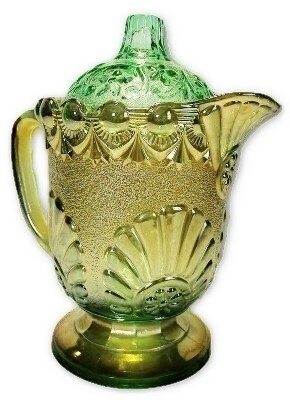 Aqua SHELL and JEWELS covered creamer. Standing 5 3/4" high and measuring 5" from spout to outside of the handle. No chips, cracks or repairs. 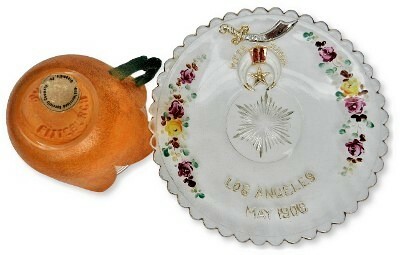 Pastel marigold SHELL and JEWELS covered creamer. Measures 5 1/2" X 5" X 3 1/4". 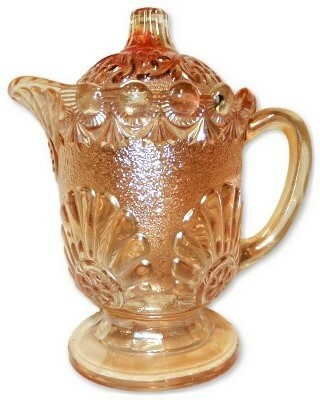 What makes this example so unusual is the fact that the lid to the creamer is partially iridized. 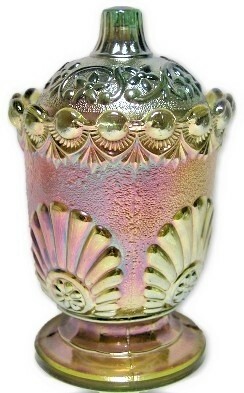 There are only a handful known examples with the lids to also have iridescent carnival glass finishes as this one has. This item has a few very tiny edge flea bite flakes, a couple on the underside of the pedestal foot, one on the underside edge of the lid and one inside the base rim where the lid sits, they are so minor that they are nearly unnoticeable unless pointed out to even a seasoned collector. No other chips, cracks or repairs. Shell & Jewels green iridescent covered sugar. 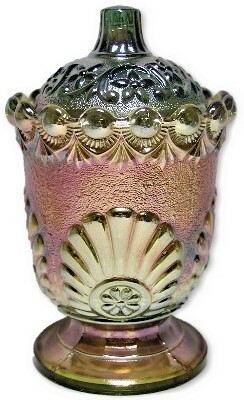 The Westmoreland Shell & Jewels sugar is known for not having their matching lids ever iridescent finished. Well, this original lid is iridized! The sugar measures a total of 5 3/4" X 3 1/2". 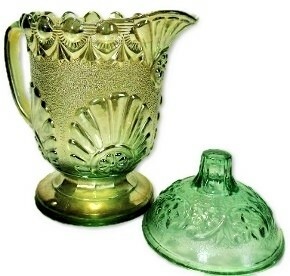 The green base glass is covered in a marigold finish both on the base and lid. There are flakes around the edge of the lid and several on the finial as well. No damage to the base. 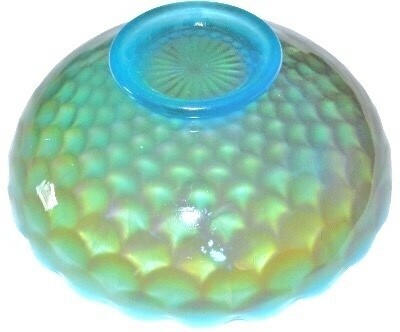 Westmoreland "SMOOTH RAYS" ruffled bowl in Teal. Measures 8 1/4 " X 3 1/2 " No chips, cracks or repairs. Purple Strutting Peacock covered sugar. Measures 5 1/4" X 3 1/2". No chips, cracks or repairs.